So I started off pretty strong with some reasonably regular postings here and then I got a bit sporadic the last couple of weeks. While I’ve been trying to keep this blog focused on writing and editing, I’m going to explain this one because it means something to me. I’ve been working with a ballot initiative that aims to put two important issues to vote in my state: raising minimum wage and capping payday loan interest rates. 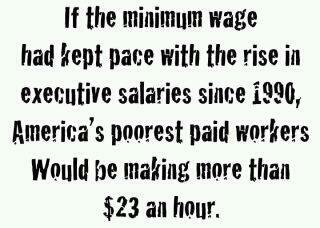 also spent my fair share of time as a minimum wage earner. Before I managed to sneak my way on to a college campus, I was a bartender, a janitor, a telemarketer, and all of the other things that most people are forced to be in order to keep food on the table. And you know what? It doesn’t pay the bills. I worked at a large ‘department store’ for a time and my schedule was unerringly set to 20 hours one week and 50 the next. Something about labor law here allows that overtime is accumulated per pay period and not per week. It also allows that full time is achieved in the same way. If that wasn’t enough, I was paid minimum wage. So once every other week, I was working longer hours than any one manager and I received no benefits and an hourly wage that was largely spent by time the bills were due. So yeah, maybe self-interested businesses with no investment in their employees or host nation will continue to ship their jobs overseas where children can di it for 40 cents a day. And maybe small businesses will have to reconsider growing their company until they can make each pay period. And, hell, maybe we’ll all just have to stop eating where the surly fry guy works because regardless of his wage, that kind of food will kill you anyway. The payday loan interest cap is a different altogether. The most common arguments against it boil down to two things: government moderation of business is bad and people can choose not to patronize these vultures. The amount of government regulation in business is a discussion for you to have with your local poultry processing plant. Visit. You’ll get a first rate tour of how well the economy self-regulates when left unchecked. And no, some people cannot choose to patronize the payday loan places that ask a pound of flesh for a $36 loan. Banks refuse to build in low income areas. Even check-cashing grocers will limit amounts and require identification above and beyond what many low income wage-earners have available. I live in an area with a lot of undocumented workers who can only use payday loan facilities because they don’t have a social security card or driver’s license to open an account at a reputable bank. And these places would make you long for a local loan shark. The fees for payday loans are extremely high: up to $17.50 for every $100 borrowed, up to a maximum of $300. The interest rates for such transactions are staggering: 911% for a one-week loan; 456% for a two-week loan, 212% for a one-month loan. And the government knows this. A Federal law and a Department of Defense rule caps payday loans for military members at 36%. All that this initiative is asking is that the same courtesy be extended to the rest of us. Anyway, I don’t expect to spend much time on a soap box, but there you have it. With the close of the ballot drive looming, I will hopefully be back onto my editing process and whatever discoveries I make during that time.